MUCH ADO ABOUT STUFFING: Artisinal Kosher Charcuterie with seasonal accompaniments. 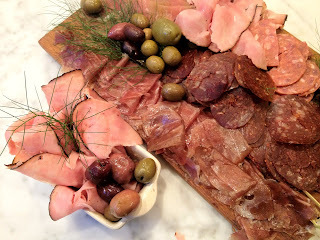 I'm working on an article for Bitayavon on some of the terrific options now available in the world of Kosher Charcuterie, but you don't have to be kosher to prepare this wonderful summery feast. In fact, it would be the perfect picnic menu. You might think you are in the Marais! The Carrot Ginger Soup is lovely hot, warm, or cold, and improves with age. Swirling a big spoonful of harissa (or srichacha, or chipotles in adobo) into mayonnaise is a great counterpoint-- and only adds to the already stellar nutritional qualities of the concoction. 1. Saute onions, garlic, and ginger until they begin to soften, stir in saffron, paprika and cook about 5 minutes. 2. Add chopped carrots and saute 10 minutes. 3. Add stock and juice, salt and pepper, reduce heat, cover and cook until carrots are very soft, about 45 minutes. 4. Use an immersion blender, regular blender, or food processor to blend thoroughly.